The picture should ask the question for me. I know I need to choose which apps. Thanks. 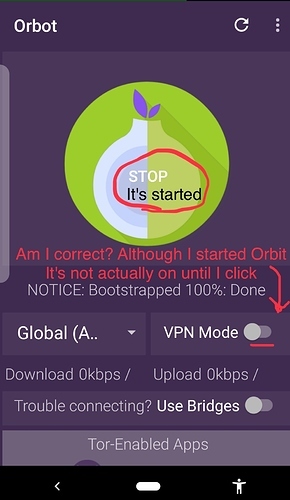 There are apps like orfox, heaven and privacy browser that can directly use orbot to connect to tor network. When the onion is green it means those apps can connect to tor, but apps that don’t support Orbot can’t. If you want to use an app that doesn’t supports Orbot with tor network, you can use VPN Mode. It uses android’s built-in vpn feature to send network traffic of other apps through tor network. Thank you, thank you, thank you! Even in my dotage I love to learn. As long as I glean a little knowledge, it is of no consequence to me if I appear the fool for asking questions. Even questions where the answer is probably apparent to most… Thanks again! The newer Tor Browser (which will replace Orfox) even has this integrated so you don’t need two apps, enable Guardian Repo to get it. Thanks. At least I know how to add repos. Apologies to the forum for having to “hold my hand”. I’ll try not to squeeze too hard. It’s okay. We always search for answers. Forums are created for this purpose. We live for getting knowledge about everything.